If you have crooked, overcrowded, chipped, or broken teeth, you might be considering restoring your smile with cosmetic dental procedures such as veneers or bonding. But what are the reasons to repair your teeth beyond the cosmetic? You may be surprised to learn that some issues that seem to be only related to the appearance of your teeth actually can affect your oral and overall health. 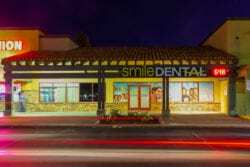 Smile Dental Group of East Palmdale CA are an experienced dental team who can help restore and preserve your smile. Overcrowded or crooked teeth may be the result of a deeper problem beneath the gums. Your teeth may move around in your mouth, and become overcrowded if there’s no room for them to move. Teeth with no room to move can crack or fracture as they grow into each other. This can be painful and even lead to infection if left untreated. Crooked, chipped, or broken teeth are also more difficult to brush and floss properly. When not cleaned properly, your teeth begin to suffer from plaque build-up. This build-up begins to erode your tooth enamel and irritate your gums, causing gums to become infected and teeth to become loose. Doctors have established a link between progressive gum disease and systemic health problems such as heart disease. If teeth are crooked or your bite is not aligned properly, over time your teeth will wear unevenly and this can cause premature tooth decay or pain. A common cause for excess tooth wear is an uneven bite, which could be the result of an overbite, underbite, a jaw injury, crooked or missing teeth, or even an uneven crown or molding fit. Excess wear of teeth can lead to other more serious dental health concerns because once teeth are worn down to the more sensitive layers of dentin beneath the enamel, they are even more vulnerable to infections and pain. If the issue causing excessive wear is left untreated, a person can wear their teeth down to their stumps. At this point, bridges, crowns, root canals, implants or even dentures may be needed to remedy the issue. As stated previously, gum disease is linked to overall health issues such as diabetes, heart disease, and even Alzheimer’s. An uneven bite, fractured or overcrowded teeth, or even missing teeth can lead to gum disease merely because they are more difficult to clean properly. In cases like we elaborated upon above, correcting what seems like a cosmetic problem can actually keep your entire body healthy. 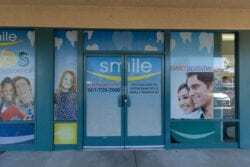 Smile Dental Group of East Palmdale CA are experienced dentists who offer many different types of conservative, effective treatments to fit your needs. Call 661-463-6530 or contact our East Palmdale Dentist office online to schedule a consultation with our office today to keep your smile healthy and your confidence high!